Four Southern Illinois University Edwardsville undergraduates have taken the same research theme and explored it in different mediums to produce original scholarly contributions. 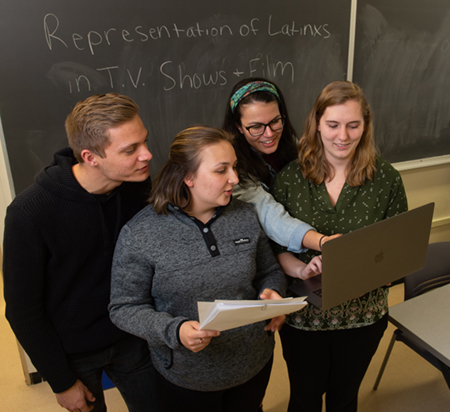 The students presented their research projects highlighting the representation of Latina/o in film on Saturday, April 6 at the Spanish Saint Louis Symposium hosted by Saint Louis University. The students all conducted their research via SIUE’s unique Undergraduate Research and Creative Activities (URCA) program, under the direction of Carolina Rocha, PhD, professor in the Department of Foreign Languages and Literature. Junior Ethan Hill, of Edwardsville, is majoring in international business, Spanish and French language and literature. He studied Latinx representation in the television show “Blue Bloods.” Senior Spanish education major Rachel Liefer, of Red Bud, examined the representation of a Latino high school math teacher who inspired Latino students in East Los Angeles. “My URCA experience has put me in a position to connect and build bonds with other motivated and educated students interested in research,” she added. Photo: Practicing for their presentations ahead of the Spanish Saint Louis Symposium are (L-R) Ethan Hill, Miranda Foley, Jennifer Gaytán and Rachel Liefer.